Even if kids “aren’t your thing” here is why children’s ministry should be of top importance in your church. I’ve invited Dustin Day, Pastor of Youth and Family Ministries at True North Baptist Church to share with us today. Why? 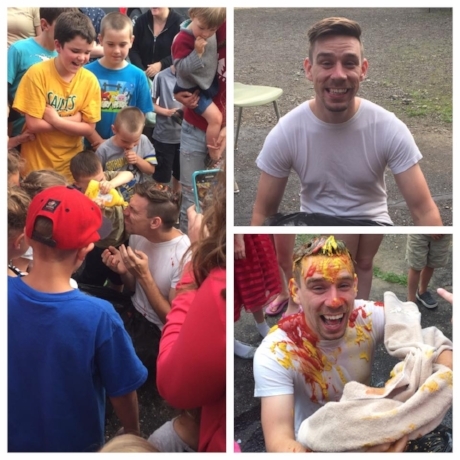 Well because Dustin would say he’s never felt called or equipped specifically to children’s ministry and yet, here he is serving where a large part of his role is facilitating children’s ministry. He’s decided to work hard at figuring out children’s ministry and how to come alongside kids and parents because he has recognized the huge difference it can make to lives, families, churches and the community. Dustin has always felt called to invest in the rural church, the hope of every neighbourhood and so he gets that not everyone has a lot of time and money to give to every ministry. I’ve been so impressed with the way Dustin soaks up everything he can - books, workshops, conference, podcasts and conversations about children’s ministry - even though he’d say it’s not his strength, all so he can get better at reaching kids with the Gospel. Dustin’s journey can help you on your journey to prioritize children’s ministry. Here’s Dustin…. Those two words alone are enough to cause any (and probably every) adult to cringe (don’t lie—I saw you cringe from here). The attention span, the noise, the defiance, the snacks (okay—that’s a pretty big perk to children’s ministry) all these things run through our minds in the moment we hear the words "children’s ministry." The truth is that Children’s Ministry is probably the SINGLE MOST IMPORTANT ministry any church can participate in and has the greatest impact on God’s Kingdom. Go ahead — think back to when you made the decision to follow Jesus. Chances are that it was somewhere before the age of 18. If that’s not the case for you then the person who led you to Jesus probably made the decision before they were 18. Why do I say this? Because statistics show that 64% of adults in the church state that they made the decision to follow Jesus as children or youth. (Check my facts HERE.) In fact, 43% say that they made their decision before reaching age 13. (That’s to say that nearly 70% of adults who say they became a Christian before age 18 actually made the decision before age 13.) As a pastor of Children and Youth that screams that I need to be putting my focus on bringing children to the foot of the cross and inviting them into relationship with Jesus because lasting faith begins in the formative, developmental years. When I was studying to enter into ministry I kept hearing reference to the 10-40 window —maybe you’ve heard of it too. In 1990 Dr. Luis Bush coined the term to refer to the part of the world that sits between 10 and 40 degrees north of the equator in North African, Middle East, and Asia. This part of the world was, at the time, the largest unreached people group in the world with 90% of the people living in that window having never heard the Gospel message. By the time I was hearing about the 10/40 window Dr. Bush was working alongside other leaders and organizations and developing a new missional window of opportunity — the 4-14 window. This time the window of opportunity wasn’t for a specific place but focused instead on a people group, specifically the age of people all over the world. (By the way, there has been a major change in the 10/40 window as a result of the Spirit’s work there and an emphasis on evangelism in word and deed. So much change that missionaries are being sent from the 10/40 window to the rest of the world… including to North America.) Let’s focus on the 4 to 14 window. What an amazing age for children to hear, engage with and respond to the Gospel! The 4-14 window represents the age group of those aged 4 to 14. These are the days that people are most open and receptive to the gospel message. (4-14 Window Explanation) Children’s Ministry is more than just slime making, glue sticking, and the next big event. Children’s Ministry is the single greatest neighbourhood mission opportunity your church can participate in. Children’s Ministry has lasting and lifelong impact on a soul for discipleship. What a child experiences, learns, and believes in can set a child up to be a servant of God way beyond the age of 14. Think about it—when a child reaches middle and high school their development is such that they are pushing back against what they know, they are seeking independence, and they are wanting to discover more about the world around them and process all they are learning and experiencing based on what they know foundational truths to be. If a youth has learned and discovered the foundations of faith and has been grounded in the Truth of the Gospel then they are going to approach this independence with the understanding that there is a God whom we can always depend on in times of fear, anxiety, frustration, and confusion because He is the same God that brought Daniel through persecution, gave peace to the disciples in the midst of a raging storm, and who had a plan for Paul when he was suddenly struck with debilitating blindness. Children’s Ministry is not just babysitting kids while their parents worship — it is developing faith in a God who is real and trust in a God who cares for them. It is developing a lifelong belief that they can always refer to and live out in their youth ministry days, their university life, and their adulthood. So - Children’s Ministry is important but it also always seems to get the last fruits of our time, labour, energy, and finances (at least, it does mine) but there are some easy ways I’ve learned for Children’s Ministry to happen and make sure it is getting the importance it deserves in your church and leadership. a. In your time/preparing - How much of your time is spent preparing for kids’ ministry? b. In your education - How much of our continuing education goes to children’s ministry? c. In your focus - How much of your ministry is based on kids’ ministry? Increasingly Associate Pastors are divided between so many multiple responsibilities kids’ ministry can slip back on the priority list. Make sure all levels of leadership understand and discuss how children’s ministry fits with the wider vision of the church and how the vision is lived out within the children’s ministry. Thankfully I have a GREAT Lead Pastor who really encourages and champions Children’s Ministry. Our vision at True North is ‘Creating and Environment Where the Community Wants to Come to Church’ so I simply change a few words and make it ‘Creating an Environment Where Children Want to Come to Children’s Worship/Mid-week/Monthly Gatherings. When Teaching kids keep it to one point, one takeaway. Kid’s ministry doesn’t have to be big, expensive and complicated to be effective. Children are looking for relationship and as you colour alongside them, play with play dough, or build lego buildings you can be teaching the story of Jericho and how God helped the Israelites. You can get them to recreate the story of David and Goliath with playdough or draw what they think Jesus going to heaven looked like. Change up HOW you present your one point—every kid, like every adult, has a different learning style and can get bored easily! Change up different ways of engaging children with your Bible point - use activities, crafts, movement, memory, songs, snacks, stories…. We all know that children’s attention spans are getting shorter and shorter—rather than fight that embrace it and change things up in your ministry every 10 minutes or so move to a different space and do a different activity. This is probably the hardest for any church to accept but if you can’t do it safely and without burning people out then don’t do it—God will provide for HIS Gospel to be proclaimed through HIS ministry. In fact, you’ll multiply your impact of children’s ministry more, by involving parents/families in activities they can do together at home over running more programs and needing more volunteers to create more things at the church for kids. Not every children’s ministry event needs to teach a Bible story or drive home a biblical lesson. Sometimes (especially if the church is just starting Children’s ministry) children and families just need to become comfortable with the church building and the church people and that is going to happen through fun events and situations. God created us to play together and have fun together. Bring everyone together for fun! Thanks, Dustin for sharing what you are learning with us! Hope it helps you prioritize the 4-14 window in your church. How do we attract young leaders to ministry?